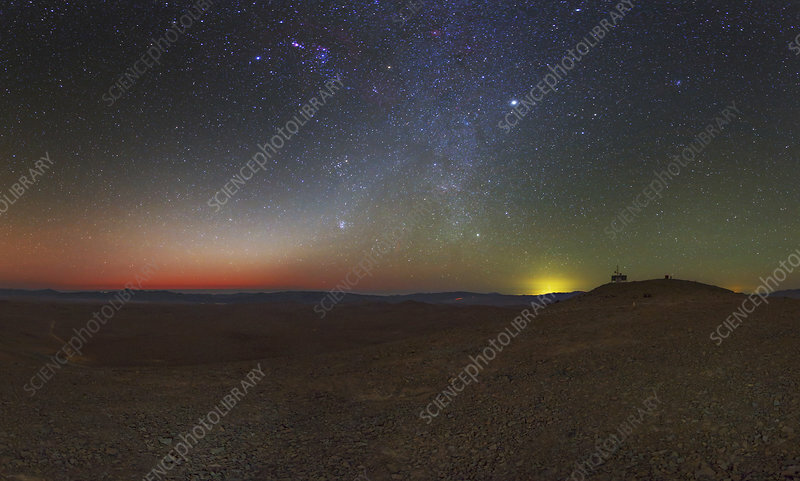 The Milky Way and zodiacal light at dusk. Zodiacal light is sunlight reflected from dust particles orbiting in the plane of the solar system. The Milky Way appears in the constellations Taurus, Orion and Gemini. Jupiter is the brightest object in the sky. The city of Antofagasta, 130 km away is the yellow glow on the horizon. Photographed from Cerro Armazones, a mountain in the Atacama Desert in Chile. This site has been chosen for the European Extremely Large Telescope (E-ELT) project, due be operational in the early 2020s.